Welcome to "33rd Degree Mason"
Welcome to "33rd Degree Mason" your online source for Freemasons information and Masonic knowledge. We are on a mission to provide 33rd Degree Mason information regarding 33rd Degree Masons. Please note, from what we understand (officially), there are mainly 3 important levels of free-masons, level-1, level-2 and level-3. We also know (at least unofficially), the Mason levels range up to the 33rd level mason, which is the highest possible level in Freemasonry. A main purpose of Freemasonry is the ongoing development of the "Free Mason" and The "Scottish Rite Mason" as ethical, honest, moral, caring, sincere and charitable men, learning about his own potential as a human being and developing his intellectual and spiritual character. 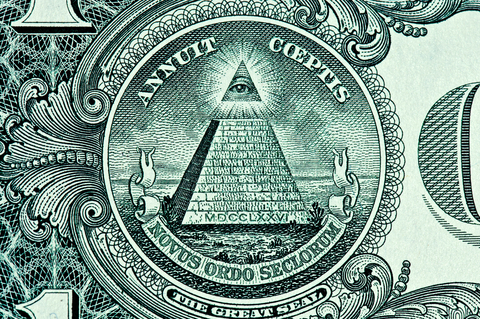 A man should never enter a freemason fraternity in anticipation of making business connections, business deals, or for any other sort of professional or monetary gain. If he does, he will be badly disappointed. Instead of wealth a far as monetary aspects are concerned, he will find a group with the personal wealth of lifetime friends and like-minded men, who are willing to treat him as a brother and share in a deep and rewarding fellowship with him. He will find genuine true friends and life-long companions. We expect men who petition for free mason membership to be good men but not necessarily perfect. We know all men have limitations and weaknesses. The freemason symbol pictured above and to the right is quite mysterious to the public as far as what it means and its origin. However, according to some masonic expert opinions the 'G' is a Masonic acronym for God. Here are a several important things you need to know and consider before applying to join a Masonic Fraternity. Freemasonry has in all ages insisted men shall come to its doors entirely of their own free-will; not from feelings of curiosity, but from a favorable opinion of the Institution and a desire to be numbered among its members. Freemasonry is a fraternity which teaches ethics and morality. Although it's not in any sense a religion or a substitute for religion, we do require that men who join believe in a Supreme Being and in the Brotherhood of Man. No atheist can become a Freemason. Although we require a member believes in God, we never try to tell a man how he must believe in God, or what religion he should practice or what worship he should follow. Those are questions of individual conscience, and the member must find those answers within his own faith. Masonry has for its foundation the great principles of the Fatherhood of God and the Brotherhood of Man. Freemasonry distinguishes between patriotism and partisanship. While patriotism is encouraged as an essential virtue both within and without the Lodge, no partisan or political discussion is allowed within the Masonic Lodge. The essential purpose of Freemasonry is additional development of the individual Mason as an honest, moral, ethical, caring, sincere and charitable man, learning more about his own potential as a human being and developing his intellectual and spiritual character. A man should not hope to join a lodge with anticipation of making business connections, business deals, or to get other professional or monetary hope. If he does looking for commercial rewards he will be deeply disappointed, for that will not be achievable involving Freemasons. Instead, the new member will find a group of similar men willing to treat him as a fellow Brother and share in a rewarding fellowship with him. He will find true friends and life-long personal companions, worth far more than money. We expect men who petition for the Degrees (Membership) to be good men, but not to be perfect. We know that all men have limitations and weaknesses. Our questions are: Does he care about others? Does he feel a responsibility to improve himself and to make the lives of others better as best he can? Is he willing to be open and honest with us and with himself? If you decide that you wish to join the Masonic Fraternity you will be given a Masonic application form. Inside the application you will find several questions. They are not asked just out of curiosity. When we accept a man as a Brother, we make a sincere promise to him that we will trust him completely and will treat his needs and his interests just as if they were our own. This application, and the visit some Masonic Lodge Brothers will make with you, will begin a process of sharing information which is vital if both you and we are to be comfortable in the relationship. 1. You must obtain a "Petition for Degrees" from the Lodge. 2. Two members in good standing will sign at the bottom after you have filled out the Petition completely to show that they are "Recommending" you to the Lodge. 3. The Petition will be turned in to the Lodge accompanied by the appropriate fees. 4. The Petition will be read at a Stated Business Meeting and an Investigating Committee will be named to contact you for an interview. 5. The Investigating Committee will report back to the Lodge at another Stated Business Meeting with their findings. 6. Your Petition will be voted on by all members present and if elected by a unanimous vote you will be contacted by the Lodge to inform you when you will receive your First Degree in Masonry. Being a man - as Freemasonry is a Fraternity or an all male organization this is a must as the lodge does not admit women. There are however Masonic organizations such as the Order of the Eastern Star, which do. In the early days of Freemasonry, many citizens were involved in indentured service and thus could not make decisions for themselves. While this is not the case in modern society, the phrase is kept as a reminder of Masonry's rich history. A prospective member must be of good repute and sponsored by someone who knows his reputation in the community. It is important that a member not be admitted who would stain the reputation and principles of the craft. No man can be made a Mason if he is an atheist. All masons must have a belief in a Supreme Being. This is an area where Freemasonry often comes under attack by religious opponents. Because Freemasonry accepts Christian, Moslem and Jew alike how that member chooses to worship God or by which name that member knows God is of no consequence to Freemasonry. While not clearly stated in all jurisdictions, this condition is placed so that a prospective member does not join the craft in the hopes of deriving financial benefit from the order. It also is in place to show the prospective Mason that the Lodge comes after his religious and family responsibilities. In most jurisdictions, the prospective Mason must be age 21, although some states allow a member to join at age 18. Freemasonry, unlike many fraternal organizations, does not seek out members. Rather it requires that members seek out the order. You will not see advertisements and posts promoting free masonry. Mr. W.D. Gann, a 33rd Degree Freemason, Legendary Stocks and Commodities Trading Guru: Click for Gann Trading technique information, or visit Gann Techniques Trading Course. Al Gore, Freemason, and 100s of other famous people, past and present day. George Washington plus 13 or more other U.S. Presidents were high-level degree freemasons including; James Monroe, Andrew Jackson, James Polk, James Buchanan, Andrew Johnson, James Garfield, William McKinley, Theodore Roosevelt, William Taft, Warren Harding, Franklin D. Roosevelt, Harry Truman, Lyndon Johnson, Gerald Ford with Ronald Reagan and George Bush being unconfirmed, Masonic Presidents of the United States.